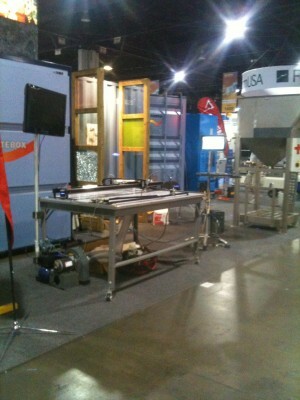 Once again in 2011, Salem Distributing — one of the leading distributors of glass handling and processing equipment –invited us back into their booth to exhibit the Carlson lami-cutter at Glass Build America in Atlanta, Georgia. Salem sells the Bovone and Hoaf Laminating lines — both autoclave and autoclave free lamination system. The Carlson cutting system is a perfect compliment for streamlining one of the more skilled and expensive aspects of any glass lamination line — the interlayer cutting. Over the last few years, working with Tristar glass in Tulsa Oklahoma, we have continued to perfect a lamination cutter for cutting interlayer used in architectural, decorative, safety, and bullet resistant glass. Interlayer like PVB, EVA, and SGP (known as Sentry) are expensive materials — typically 2-5x more expensive than glass — they also require a clean working environment, accurate cutting, and preferably as little waste as possible. Cutting by hand makes all three of these difficult — often resulting in excessive material handling, over cutting, and significant waste due to over-cuts and mis-cuts. Hand cutting is also very time consuming. Carlson Design looks to automate lamination cutting in the same way all glass companies have automated their glass cutting. By introducing automation, nesting, and repeatability into the lamination process we further transform a high margin opportunity into an entry level job skill set with nominal waste and high output. Automating your cutting typically reduces material waste by 10-20%. This means payback period for a cutter — not counting labor savings, simplified production processes, and better product quality — is usually within the first year if you are cutting 1000-2000sqft of interlayer per day. For companies cutting multiple layers (IE .015eva and stacking or .030pvb and stacking) the payback period is even faster and our cutter makes cutting layers fast, easy, and accurate. Remember that’s payback from ONLY material savings! This is a great application for our equipment. To find out more information or to tour a facility near you, please contact us today! BTW — trade shows are hard work! 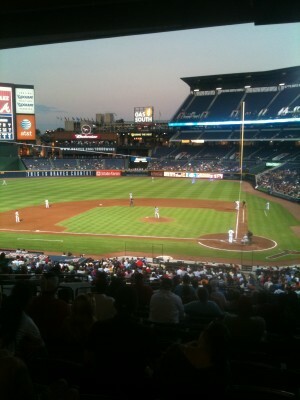 If you happen to be at next years GBA in Vegas let us know — this year we managed to catch the Braves game! Take a load off...Trade shows are hard work!